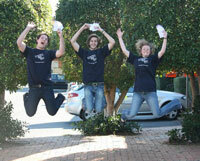 UN Youth Australia is the youth network of the UNAA for students between the age of 15-25. UN Youth Australia aims to encourage young people to strive towards a greater understanding of global issues, and to educate them about the United Nations’ structure, functions, and future. Operating as a national network of young volunteers, UN Youth Australia is based firmly on a philosophy of best practice youth-for-youth leadership. UN Youth Australia aims to develop students’ skills in vital areas such as debating, negotiation, leadership, problem solving and understanding of international affairs in an accessible and supportive environment. By encouraging young people to discuss and debate important issues amongst their peers and the broader community, UN Youth Australia gives voice to the concerns of young people. Ultimately, UN Youth Australia plays a dual role as an educational and advocacy body for Australia’s young people. Visit UN Youth Australia’s external website.